The FNS Osmotics Hair Thickening System works synergistically together to promote thicker, stronger, healthier hair and lashes. Many factors affect hair loss including stress, hormone fluctuations and the natural aging process which decrease the hair follicle's ability to receive and process nutrients necessary for growing strong, healthy hair. The Osmotics FNS line has been clinically proven to reverse these factors to bring you beautiful, healthier hair. Recently, InStyle Magazine has recommended the Osmotics FNS Hair Thickening System. Revivogen is a revolutionary product line that fights hair loss and thinning hair with all-natural DHT blockers. It can be used topically by both men and women, and unlike many other hair loss products, Revivogen has no side effects. Unlike its competitors, Revivogen growth products for hair loss are dermatologist formulated with the latest medical breakthroughs for the treatment of hair loss in men and women. 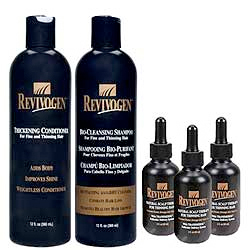 Revivogen uses scientifically proven natural ingredients to help promote new hair growth and decrease thinning hair. The main active ingredients in the Revivogen formula have been scientifically proven to reduce the production of DHT by blocking the activity of the 5-alpha-reductase enzyme. This enzyme converts testosterone to DHT and is present in the hair follicles and scalp at high levels. Other ingredients in Revivogen block the androgen receptors and stimulate hair growth. By blocking the activity of the 5-alpha-reductase enzyme and lowering the concentration of DHT in the scalp, Revivogen helps revitalize and protect the hair follicle. Because you apply Revivogen topically, it provides concentrated delivery of the active ingredients to the hair follicle—where DHT is produced—without any negative side effects. Propecia® (Finasteride), a synthetic medication prescribed for hair loss, also reduces DHT by blocking the 5-alpha-reductase enzyme. However, Propecia® may be associated with side effects such as loss of libido, and cannot be used by women. Without Revivogen: DHT causes shedding and miniaturization of the hair follicle. Click here for scientific articles on ingredients of Revivogen. 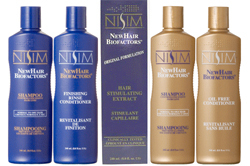 Nisim New Hair Biofactors is a botanically-derived hair care system of topically applied products formulated to help slow the effects of hair loss. These products do not require FDA approval since they don't contain drugs such as minoxidil or finasteride. Nisim New Hair Biofactors products have been shown to slow hair loss and improve hair growth in male or female pattern baldness (also known as androgenic alopecia). It also helps control hair loss related to post-pregnancy, menopause and cancer treatment. Toppek Hair Fattener from Spencer Forrest has an innovative nutrient delivery system that actually adjusts to your hair's ph to open the hair shaft and allow an infusion of body-building Keratin protein. After the protein-charged formula is absorbed, the shaft is then "closed down" to seal in the thickening proteins. Toppek Hair Fattener is packed with the highest concentration of pure Keratin protein of any Spencer Forrest hair care product. In fact, it's so effective that some users actually need less hair building fibers to achieve their full-looking head of hair. Toppek Hair Fattener can be used alone or in conjunction with Toppek Hair Building Shampoo and Conditioner. And Toppek Hair Fattener is safe to use with topical treatments for hair loss like Rogaine and Minoxidil. Toppek Hair Building Shampoo works to thicken your hair with a unique complex of Keratin proteins. Toppek Shampoo will dilate every hair shaft to allow maximum penetration of this concentrated protein formula. For those who are "in the know" Spectral.DNC® has acquired an almost legendary status with a loyal following for one simple reason — it delivers results unlike any other topical treatment in the world. Following in those footsteps the DS Laboratories scientific team has developed a new formula that is conservatively rated for thinning hair and delivers remarkable performance for hair re-growth. Spectral.RS® is a breakthrough formula for the treatment of thinning hair and diffuse hair loss. Spectral.RS® uses a proprietary nanosome technology as the delivery vehicle of active compounds directly into target cells. Spectral.RS® works by improving the nutrition, circulation, and metabolism of the hair follicle and preventing perifollicular fibrosis.